Ben McAdoo says he didn't see his team loafing late in the game, but that everyone will be held accountable. EAST RUTHERFORD, N.J. — Coach Ben McAdoo insists the New York Giants didn’t quit in their ugly, one-sided loss to the Los Angeles Rams. 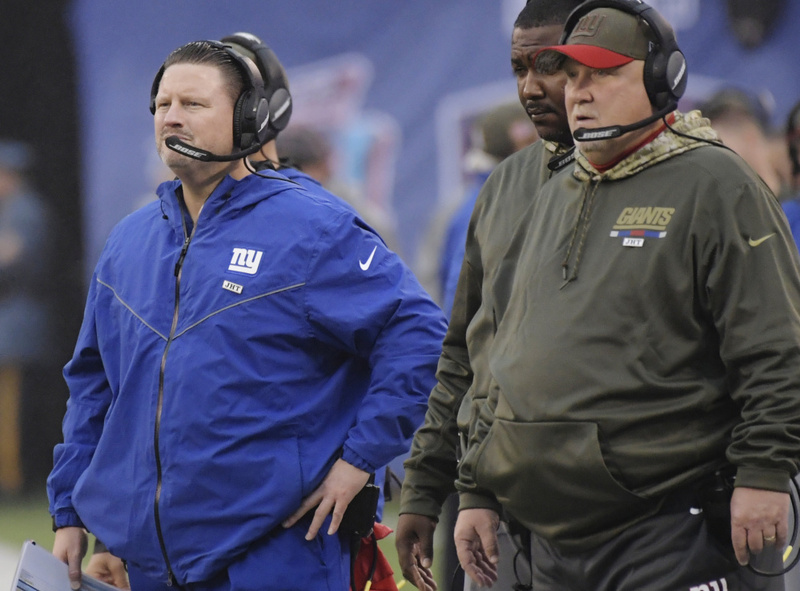 While the Giants’ performance in the 51-17 thrashing was ugly and unacceptable, McAdoo hesitated to say Monday that his team played hard to the end. The second-year coach said he didn’t see his players loafing or giving up on plays, signs he says would show a team that quit. McAdoo also said two-time Super Bowl MVP Eli Manning will remain the starting quarterback, and that players and coaches will be held accountable for the poor play. Less than a year after leading New York to the playoffs with an 11-5 regular-season record, McAdoo is clearly under fire after losing seven of the first eight games in what many expected to be another playoff season. His team is not only losing, but he has suspended cornerbacks Dominique Rodgers-Cromartie and Janoris Jenkins in the past month for violating team rules. It’s a sign of internal problems. There have been calls for the 40-year-old McAdoo to see what rookie quarterback Davis Webb can do. The third-round pick has not been active for a game this year. McAdoo said after Sunday’s game that he would consider using some young players, and no position was being excluded. However, he said Manning would get the start this weekend when the Giants travel to San Francisco to face the winless 49ers. Manning didn’t have his best game Sunday. He lost a fumble on an early sack, missed two open receivers for what could have been touchdowns in the first half, and was intercepted late in the second quarter, setting up another Rams score. When told that McAdoo was considering changes, Manning said he wanted to play.